Today, we dive into the role of an Earth Defense Force (EDF) recruit, sworn to protect the Earth from aliens and monsters, as we play Earth Defense Force: Iron Rain! My history with the Earth Defense Force series started with Earth Defense Force 4.1. I enjoyed it immensely, and ended up buying it on both the Playstation and PC. I also purchased the older games available on the PlayStation Vita, and played Earth Defense Force: Armageddon on the PC around that time. While Sandlot developed most of the games in the series, another company created Earth Defense Force: Armageddon. As expected, it had a different feel and lacked much of the charm seen in other games. In the same vein, Yuke’s steps up with Earth Defense Force: Iron Rain, attempting to improve on the formula. The result brings a fresh perspective to the series while retaining some of the charm and direction from the prior games. However, veterans may feel that it takes two steps back for each step forward. 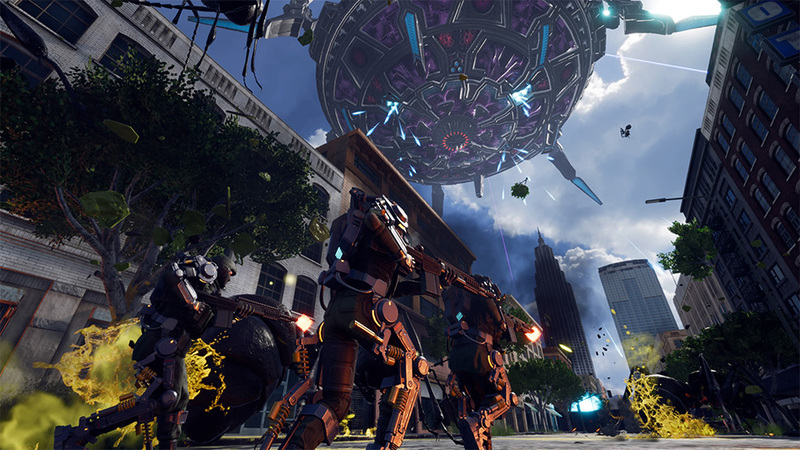 In Earth Defense Force: Iron Rain, players fight off hordes of insects, aliens, and robots in a third-person shooter. The games feature a variety of weapons to choose from, as well as a few different suits that offer different abilities and movement options. Players can run these missions solo or they can join a friend for more chaotic fun. As they do, they unlock and purchase more weapons and exo-suits which open more options for players to blow things up. 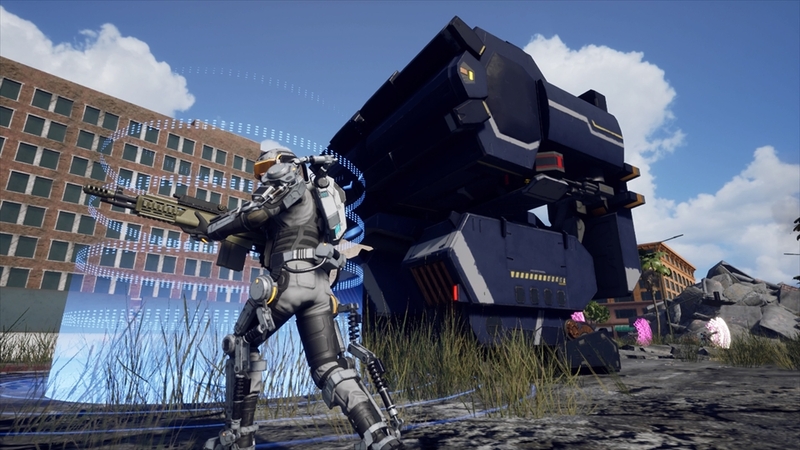 In many ways, Earth Defense Force games feel like Monster Hunter games, trading out large single creatures for waves of bus-sized ants, spiders, and the occasional Godzilla rip-off. 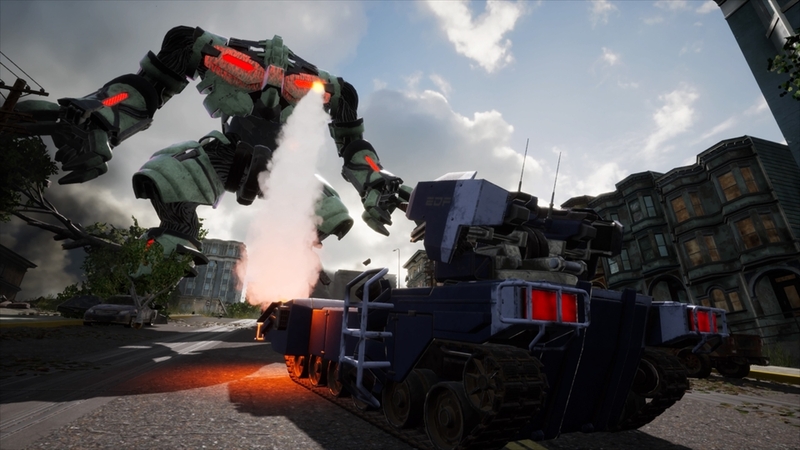 Earth Defense Force: Iron Rain continues that tradition, though it tapers down the number of concurrent insects and aliens to free up more processing power for enhanced graphics. Upon playing a mission or three, fans of the series will note a significant step up in this area with improved textures and resolutions. This enhancement includes the player models, which have numerous customization options not available in the other games. Dressing up an avatar of death always has an appeal that would be welcome in other games. With all of this said, the game overall still looks very dated compared to more modern console games. 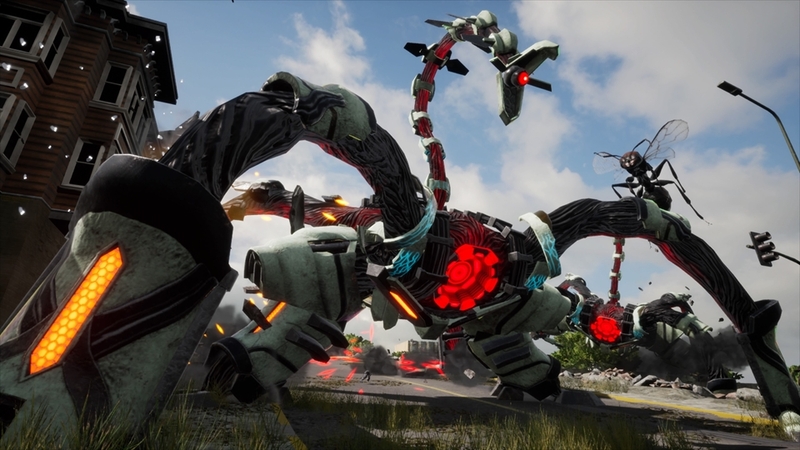 No one will mistake Earth Defense Force: Iron Rain for Horizon Zero Dawn. Earth Defense Force: Iron Rain features a bit more story than earlier entries, all voice acted. It retains the campy feel of prior games, but lacks some of the charm. The robust music impresses at first, but gets repetitive after a while. More importantly, the sound effects disappoint. Many of them simply lack the pop and punch you expect when you fire huge weapons that can blow up buildings and knock massive robots over. It takes one out of the experience when a fired rocket slams into a building with muted sounds that simply do not match up. Rather than choosing a specific class with separate weapons and health pools, players now choose one of four exo-suits that determines their abilities. One allows the player to fly around, lightly armored, while another features dual weapons with the ability to use a rechargeable shield. After that, the player will equip two weapons from their pool of unlocked weapons. As they complete missions, more weapons and accessories unlock. However, in order to use them, players must first purchase each one utilizing a combination of three currencies found on defeated enemies, as well as money earned from completing missions. With the higher costs of mid- and upper-tier weapons, unlocking a varied suite of firearms requires significant grinding. A drawback to this new system is that weapons no longer feel distinct between classes, and while there are still plenty of options to choose from, variety is lacking compared to other games in the series. Missions feel a bit of a step back from other entries as well. Most take place on much smaller battlefields than those seen in the last few games. 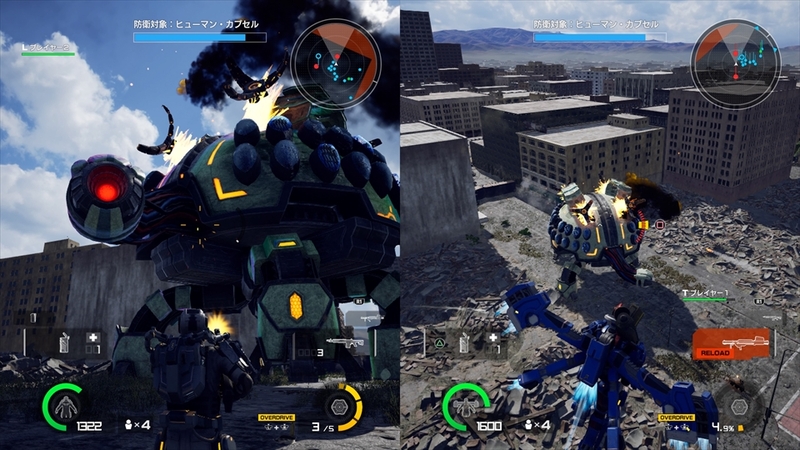 Earth Defense Force 5, in particular, encouraged players to carefully consider which packs of enemies to pick a fight with, and when. Due to the smaller maps in Iron Rain, monsters and aliens swarm the player and NPCs right from the beginning, with little time to consider various approaches. Furthermore, as one must constantly move around to avoid a quick death it’s easy to run outside the border of allowed combat, triggering warnings and a short countdown, which in turn leads to the player’s suit shutting off if they do not return. With the dozens of enemies on screen and various other obstacles lying around, many missions feel frustratingly claustrophobic. That frustration increases when one hits the later missions. 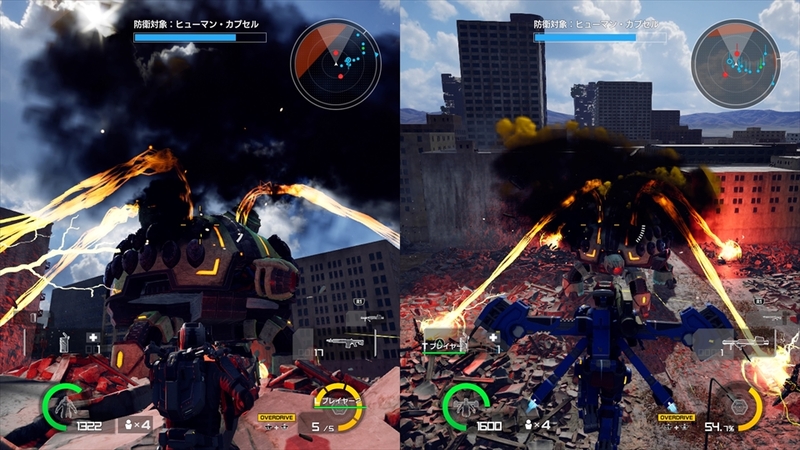 Earth Defense Force: Iron Rain provides a stiffer challenge than other games in the series, despite the fact that it often has fewer insects and robots on the screen. Enemies seem to soak up more damage, making it harder to take down even low-tier insects. When any available NPCs on the map die, all hordes turn to the player. Giant robots and aliens, in particular, hit with deadly accuracy, even when the player dodges. It is not unusual for multiple opponents to tag-team the player, delivering nasty combinations capable of wiping them out in a matter of moments. All in all, I enjoyed my time with other current-gen Earth Defense Force games significantly more than this title. In fact, playing Earth Defense Force: Iron Rain made me want to run through them again. However, I believe that fans of the series will like this game to some degree, especially if they have friends willing to take the dive with them. With that said, I recommend waiting for a sale on this one as your mileage may vary.